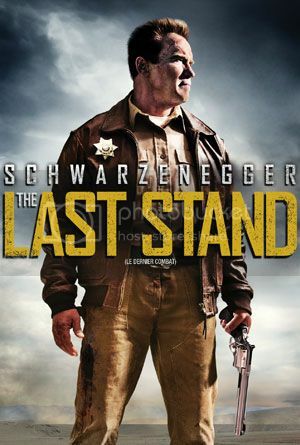 The Last Stand is about the leader of a drug cartel breaking out of federal custody and making his way to the Mexican border. The last stop in his path is a town with Sheriff Ray Owens (Arnold Schwarzenegger) and his inexperienced deputies. Something that is only a problem for me is I usually watch these bombs on their opening weekend (cause I have no life) and it is only months later that I find out they bomb. By then I have to watch it again to refresh my memory to write a review. Again, this is only a problem for me (especially for the really bad movies) and I am essentially complaining to the open air. Anyway, The Last Stand is the tale of two halves. The first half is so painfully dull I got so close to turning the movie off. You see, it takes nearly half the movie to get this ridiculous plot underway. We have to explain how the most notorious drug cartel leader in history escapes from federal custody, escapes road blocks, escapes helicopters, escapes every police agency and the military, and the ONLY person able to stop him is Arnold Schwarzenegger. A killer robot from the future is frankly more plausible after seeing the things the writers pull out of their collective asses. But the worst part is none of it is interesting. We know this is the dirty work of getting the plot underway and there is no chance of the bad guy getting stopped prior to getting to the town so we are just sitting as the movie goes through the motions. It might ease the pain if the characters are interesting or if the dialog were fun but outside of Arnold, there is no one I care about. Forrest Whitaker has the thankless role of barking out feeble administrative lines like “Talk to me people!” or “Get so and so on the line!” or “I want this guy caught yesterday!” Every once and a while we check in on Arnold and he gives his usual cheesy line reads that make you wax nostalgic or laugh at Peter Stormare who I think is trying a Texan accent but if it is it is officially the worst attempt at an accent ever. But all of that is fleeting as we have to sit through another scene of tension-less driving from the bad buy or another scene of boring exposition about how an attack helicopter couldn’t blow this guy’s car off the road. I don’t care. It is not until the halfway mark that we finally get our main characters in an action scene and I let out an enormous sigh of relief. The movie spent a long time establishing the climax and when it comes, it thankfully does not disappoint. The action is fun and Arnold does enough badass things to make you squee. There is a good dose of self-deprecating humor and all in all it is a well choreographed action scene. If it is one thing the director got right, it is how to effectively use Schwarzenegger in action at his age.